Many of you have asked for resources on finding some of the more specialty items used to make bags for the Cooper Sew Along. I’ve spent more hours than I can count researching this stuff as we planned our kits, so I want to share some of my resources with you today. I have used most of the products I’m recommending below, or at least have samples of them. I’ve organized these into the various supplies you might be looking for, but note that a lot of these stores sell a variety of outdoor and specialty fabrics and hardware. So you can likely find more than one thing at some of these, depending on what you’re looking for. 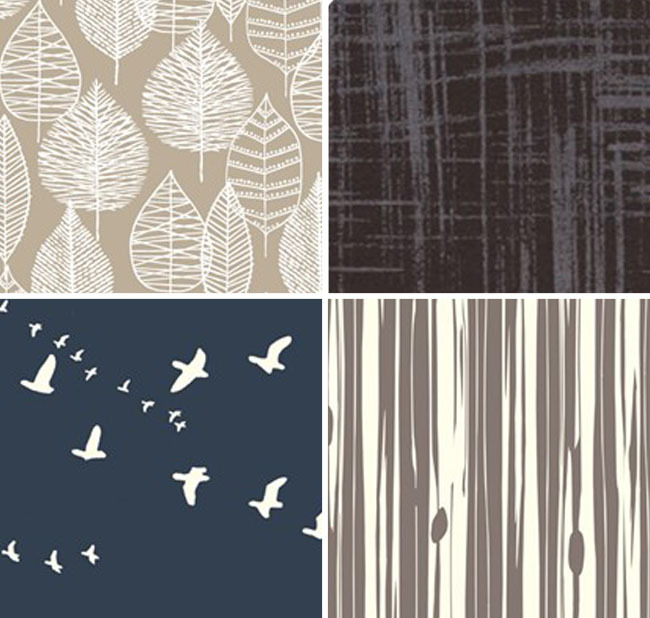 Organic Canvas from Birch: Fabricworm carries some awesome prints in organic cotton canvas. I love that there are prints suitable for men, women, and kids here AND that it’s organic. Some prints are pictured above. Hart’s Fabric: How about some nice striped ticking? They also have a lovely selection of canvas. Spoonflower: Make your own print, or choose one from their vast selection! All of their fabrics can be ordered in twill and canvas. I’ll be using Spoonflower to design my own Cooper soon. Big Duck Canvas: This canvas is very affordable, comes in several weights, and is offered in a wide variety of colors. If your machine can handle it, I like the 10oz weight. ahh.biz: This store sells a lot of what you might need or want, including canvas, nylon cordura in both 500 denier (good for lining) and 1000 denier (the kind of fabric backpacks are made from). They also have hardware and webbing. My only hesitation is that (1) their website is bloody awful – turn off your computer’s sound before you go there. And (2) their customer service was pretty lackluster when I had a shipping issue. Pendleton: We used Pendleton blanket weight jacquard for one of our backpacks, and it is an AMAZING bag fabric. Soft, gorgeous, hard-wearing, and milled right here in Oregon. Their website is pretty limited on the patterns and yardage, but if you are in Portland, the woolen mills outlet is an incredible resource. Military waxed canvas: AHH sells this rather affordable canvas (starts at $18/yard), but it only comes in olive drab. Fairfield Textile: This is my favorite source, but they do have a minimum. The brown samples of Cooper were made from Fairfield waxed canvas, and I have a swatch book of all their colors, and the palette and quality is outstanding. However, I think the minimum order is 5 yards, so you may need to make a lot of bags or get some friends together to make it worth the cost. Fabricline: This is the web store of our beloved outdoor fabrics store here, Rose City Textiles. They have a few types of waxed canvas. I have seen these in person, and I’d advise ordering swatches. The superwax is quite lightweight and seems more suited to lining. I’m afraid they might be sold out on some of the others, so you might want to call. They are really nice people. 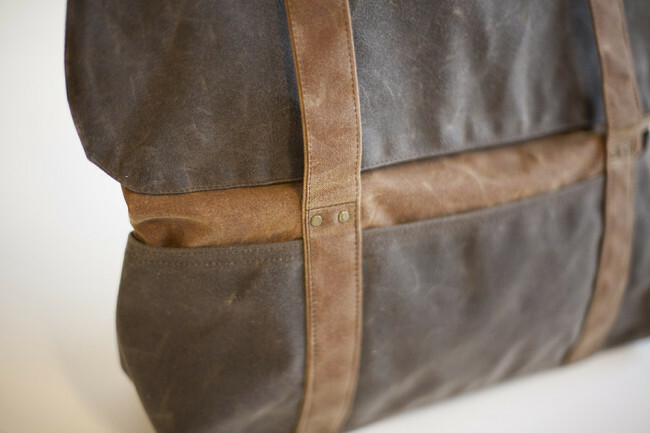 Rough and Tumble Bags: This bag maker sells waxed canvas by the yard in a few colors. Fab Crafts UK: Thanks to reader Siobhan for alerting us to this Ebay seller! For those in the UK, this is a source for waxed canvas. Merchant and Mills: Another source for the UK. All of their things are so lovely. They sell waxed canvas (oilskin) by the half meter. I believe there is only one color. Check out their other fabrics too, just gorgeous. Fabricline: They have so much ripstop! They even have an organic cotton ripstop! I’ve made some bags with cotton/poly ripstop like this and though it’s not water resistant like nylon, it is a dream to sew with. Rockywoods: This company has good prices on nylon ripstop and other outdoor fabrics. I like the 1.9oz ripstop, and it comes in a variety of colors for a good price. Silverstone: If you want the really high quality faux leathers, check here for sure. I’ve ordered some fantastic stuff here and the deals are amazing. Izit leathers retail for $112/yard, but they have a black one for $37.50. Our bag designer, Laura of Pansy Maiden, also recommends Knoll faux leather for really good quality. The prices here are pretty amazing for the quality you get. They also sell leather. Ahh.biz: They carry the 1.5″ cotton webbing you’ll need in several colors. This is good, heavy webbing. The Village Haberdashery: So much webbing and in unusual colors too! This is a particularly great choice for those in the UK. Etsy: Just do a search for “1.5 cotton webbing.” There are a lot of sellers! Here’s one selling it in several colors. Strapworks: So much webbing! You can get cotton, nylon, even webbing printed with patterns! 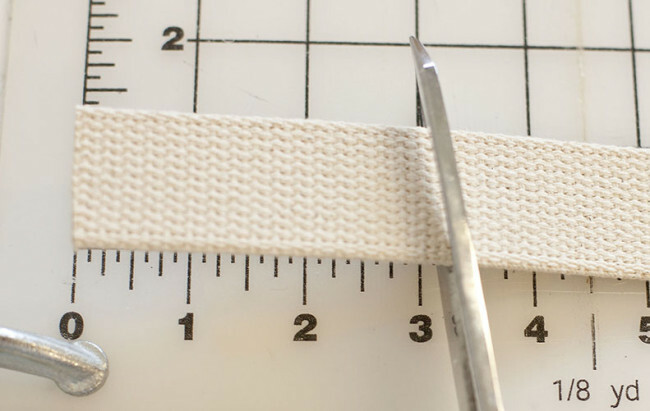 A note on webbing: I’ve noticed that 1.25″ webbing is easier to find that 1.5″. I think 1.5″ looks better, but you can definitely go for the more narrow one if you’d like. You might want to size down your hardware a little to fit, though. Also, you can follow the instructions in the Cooper Companion to make your own self-fabric straps and avoid webbing altogether. It’s a really good-looking option too. Gifts for Crafters: I highly recommend our hardware kits, because it’ll probably save you time and money hunting down hardware from different places that might not quite match. I’ve been there while sourcing these kits! But if you want something else, like a different color or finish, read on for alternatives. Ahwok buckles: This is really intended more for pros, so you have to order large quantities. But the prices are good and the selection is huge. 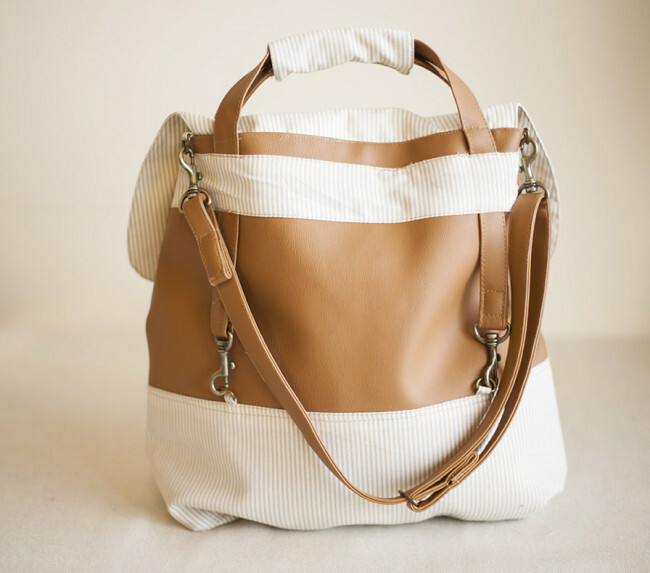 Being Bags: This Etsy store has a good selection of hardware as well. Laura says she orders from them. The quantities might be a little high. Again, try searching around on Etsy if you can’t find what you want here. Hardware Elf: Lots and lots of hardware options! Definitely a good source for jiffy rivets. Ahh.biz: This store really does have almost everything. They have a large selection of hardware. A note on Jiffy rivets: Your local fabric store might sell jeans rivets, which tend to be a bit bigger. But we’ve used those too, and they are also an option! Hope these resources can get you guys started! Does anyone have other resources to share, particularly outside the US? For those of us living in continental Europe I can also recommend extremtextil.de. They have a great lot of outdoor fabrics, including some heavy duty waterproof cotton called ETA-Proof (not waxed), light rip stop fabrics and all types of hardware as well (although most of the hardware they carry is plastic). Thanks for posting — so many options. I am wondering if any of you have ever tried waxing an accessory after its made. There are a few videos demonstrations on the Internet, but I’ve never tried it myself. Also — technical question: When I’m transferring the markings to the cut pieces, should I be marking the seam lines as well? I haven’t tried it. I wonder if the wax would build up in the seams and thread? I don’t know, but maybe someone else does. You can mark the seam lines if you want, but it’s really not necessary. We included them just for clarity. We usually can’t because grading interferes, but sometimes it’s helpful to see them at a glance if you’re not strictly following the written instructions. Thanks, Sarai. I suspect you’re right about the wax buildup. From the demos that I’ve seen it seems like it would take some practice. I think the seamlines are going to be very helpful in my case. It looks like my son’s beautiful old Singer 66 will be better equipped to handle the canvas, and the seam gauge is a little tricky to use. Definitely looking forward to this! Thank you for this list, Sarai. What weight would you recommend for waxed canvas? I like something around 10 oz. Just make sure your machine can cope with sewing through multiple layers of heavy fabric like this, and be sure to use a large sized needle. I forgot about that, thank you! Her book on bag making is great too. I love Big Duck Canvas!! I use it for all of my bags in my etsy shop. I personally use the #12 (11.5oz) Duck and find it a pleasure to work with, grant it I have a tough machine. If you do go this route please remember to pre-wash your fabric, I had one-way shrinkage of about .1 inch for every inch after the first wash, after the second it seemed to stop. three other suggestions…. goodwill/your local thrift shop/army surplus for old leather jackets, handbags and gear…. rip apart and re-use the good pieces. and for hardware, the local hardware store. i’m a constant source of amusement to the local ace hardware because i come in with problems to solve that fall far outside their general contractor clientele. acetone tube for stripping broken wires out of fencing foils? a way to create and attach a consistently adjustable weighted bobbin holding the floating selvedge for a floor loom? haven’t stumped them yet…. Good tip, and I like the idea of using recycled leather pieces. Will you have the full kits back in stock anytime soon? We’re deciding right now if we’ll restock something similar. Unfortunately, I think we cleaned our supplier out of the waxed canvas we bought for them and we cleaned our OTHER supplier out of the lobster clips for version 3. So I need to do some research to see if it’s possible. I hope you do, it’s at the top of my christmas wish list. I want 2! I’ve really struggled to find affordable hardware in the small quantities that I need. I liked the selection of buckleguy.com but their shipping is high and it took a while. The best deal I’ve found is strapworks.com, they are used to dealing with larger orders, but they were very helpful with my tiny order of two items, and even let me change it when I changed my mind and it was cheap! And the moment I say that, I load it again and it shows up for me. Crazy browsers! Good, you had me worried for a sec! Hi, You read my mind, I was googling fabric choices today when your post popped up in my Feedly stream! Can narrower fabric be used for the main section? I found a very pretty indian handblocked canvas…. BUT it is only 76cm wide! Seattle Fabrics is also another resource. I couldn’t find Waxed Canvas, but they have lots of outdoor fabrics and webbing. Thanks for mentioning these. I’m new to Seattle and was wondering where to go for hardware. Will you be selling the hardware kits through your website after the gifts for crafters shop closes? I’d love to make one of these bags sometime, but I don’t have the money for the pattern and supplies right now. 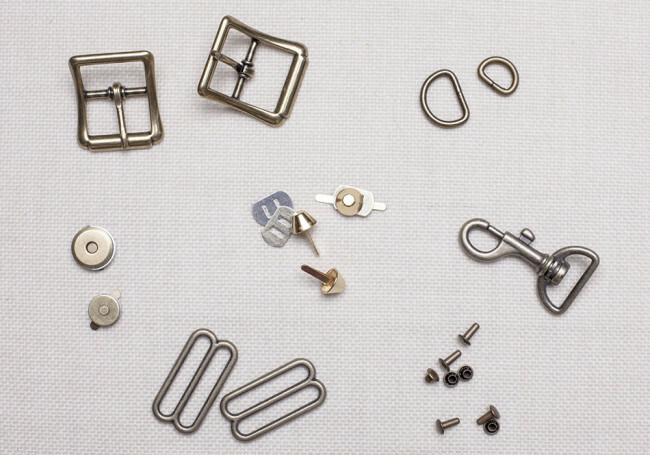 If you are in the Vancouver area, Dressew is a good resource for a huge range of random cheap hardware; you can buy packages or single buckles, clips, rings, etc, and they are usually pretty cheap. They also carry some heavy-duty and outdoor fabrics, but I can’t speak to selection or quality on that point. Plus, now that Halloween is over, you can actually get in the door again! Was just there today to pick up metal slides and rivets! Had to go all the way out to Fabricana to find the faux leather I wanted though. Don’t forget Outdoor Innovations at 1005 Kingsway for fabrics and hardware. More pricey than Dressew but they have more selection on some items. 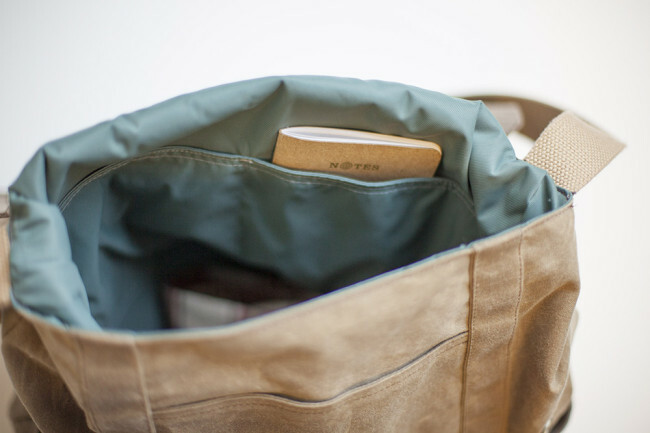 The bag you made from Fairfield waxed canvas – was it the 10.10oz army duck you used? I’m making this for a Christmas gift and want to make sure that I get it right — I know the recipient likes the samples so want to do something on par. Yes, it’s 10 oz, and the colors Laura chose for those samples are Brush Brown, Dark Oak, and Field Tan. Tandy Leather has a lot of hardware options; I was just there yesterday and noticed they had the same clips recommended for the satchel. They also have a pretty wide buckle selection. The website ships pretty quickly, usually, and if you have a store within easy distance I’ve always had great experiences with their employees. There are three in the greater Los Angeles area, I’ve been to them all, and they’re all fabulous. They also have bag-weight leathers, a wide selection of leather dyes, and often have good sales. Not to mention if you buy a lot from them, purchasing a membership pays for itself. Highly recommended! Tandy has a presence here in Texas as well for any of my fellow Texans that didn’t already know that. I can agree that it’s a great place to get hardware for these sorts of projects. I know that there are locations in both Austin and San Antonio. Really nice quality and free shipping in Aust. It is only the 1.25″ though. We have so many fabrics and leathers online. We also have purse hardware. Please feel free to e-mail us if you don’t see what you need. Woot, bought my supplies the other day. In addition to ordering the hardware kit, I bought a lovely printed cotton canvas and a matching faux leather. I haven’t really worked with faux leather before, so this will be an interesting experiment. If I can swing it, I’d like to make my backpack straps out of the faux leather as I don’t particularly like the look of webbing straps. I also bought some purse feet that I think will match the other hardware well enough and some leather needles. Fingers crossed that this turns out ok. 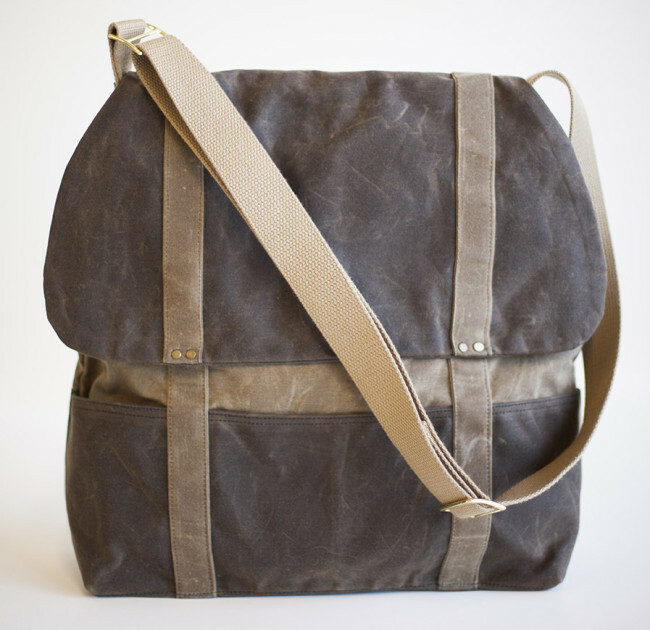 I haven’t been able to find the waxed canvas in the forest green and oak as shown in the satchel. Can you tell us the specific source for this fabric. Even though the supplier may be out of it currently, we will be able to check for it later. Thank you. I don’t see the brown anymore. The forest green is still there, but I’m pretty certain we bought all the rolls they had. They sell factory ends, which is why I don’t *think* they’d be getting more in stock. However, she did tell me that it’s a popular item, so perhaps they might get it again, or something else. They’re extremely nice, helpful people if you need to contact them. They do some great oilskin and canvas and lots hardware. If anyone is lucky enough to live near Rye then a visit to their shop is a must! I went to Mood fabrics store today and purchased my fabrics and lining! They didn’t have any waxed canvas but I found some really nice cotton twill. I’m hoping my sewing machine can handle it. Now I just have to wait for my pattern and cooper hardware kit to arrive in the mail this week. Can’t wait!! Thanks so much for your effort in putting this together – what a great resource! How difficult is it to sew through the waxed canvas? Would a typical quilting sewing machine handle it or do you need a machine that can handle leather? I think a quilting weight machine can likely handle it, provided you use the right needle. But I’d like to hear from some others on the issue. My machine is not industrial (Bernina 430) and it had no problem. Pacific Blue Denims has a good selection of canvas, twill, ripstop etc. The website states the weight of each fabric, and you can search for US-made. There are also a couple of webbings. Up to ten samples sent free to US. A great place to get leather and hardware is Tandy leather. The online shop has everything!